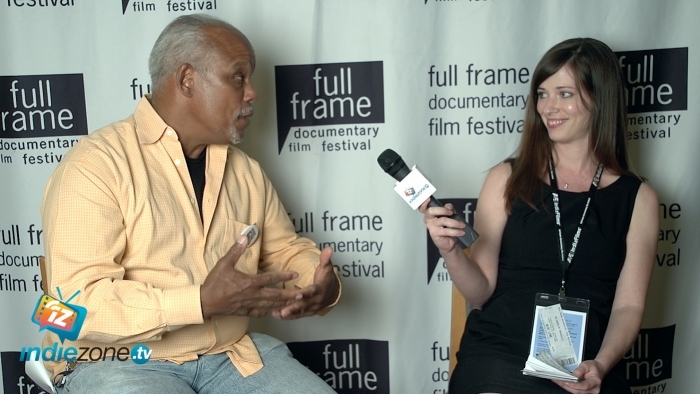 Luminary documentary filmmaker Stanley Nelson, a MacArthur Fellow, sits down with IndieZone’s Samantha Collins at the Full Frame Documentary Film Festival to talk about Black Panthers: Vanguard of a Revolution. The film is an honest look at the inner workings of the polarizing counterculture movement. Vanguard screened to a capacity audience at Full Frame. Nelson is no stranger to exploring politically-charged subject matter. While most of his films focus on the American civil rights movement, he also garnered praise for his coverage of Jim Jones and his tragic adherents in Jonestown: The Life and Death of Peoples Temple. “Cameras loved them and they were covered extensively by the media,” he added. “You can never have too much,” Nelson said of the expansive source material. But working with such a great body of archival footage can also be cumbersome. Ultimately, cuts must be made, and compromises reached. In Vanguard of a Revolution, Nelson also examined questions of gender. The Women’s Rights Movement, he said, was closely interconnected with black activism, and by the early 1970s, the majority of Black Panthers were female. But the party’s visibility, coupled with its oft-militant disposition, inevitably drew the attention of law enforcement. As they began to institute grassroots social programs, the FBI began to take a more thorough interest in the group’s activities. Take, for example, the Black Panthers’ “Free Breakfast for Children” program. Despite the initiative’s simple goal to, well, provide free breakfast for children, Nelson said the FBI viewed it as an “insidious” attempt to “win the hearts and minds” of the black community. “It was very important that we talked about that in the film,” he said. The Black Panthers’ eventual collapse, too, served as fertile ground for Nelson’s film. While the reasons for its fall are numerous and complex, Nelson emphasized that internal factors played a significant role. Though charismatic and capable, Nelson said, party leaders Eldrige Cleaver and Huey Newton were also prone to mercurial, self-destructive temperament. “Eldridge and Huey were not the most stable of human beings,” he chuckled. “It’s kind of like a relationship that ends ugly. If you have a relationship and it ends ugly, then that’s how you remember the relationship. You don’t remember, ‘Oh, there were these good times,’ you remember the bad times.